Debra Schoch's designs are an example of the best primitive, whimsical holiday folk art! 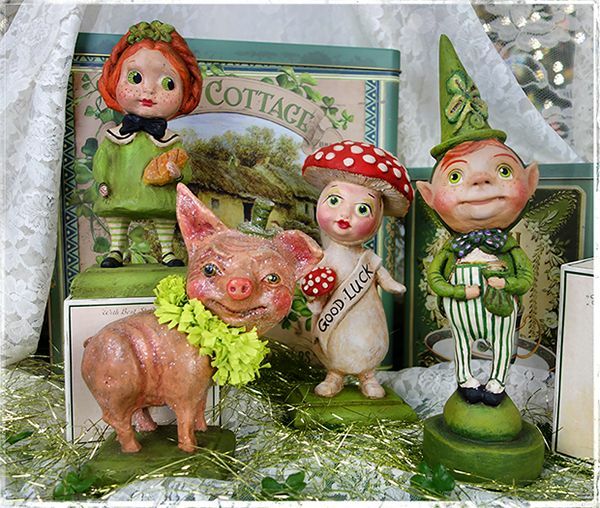 Debra's holiday-themed figurines are inspired by turn of the century books, toys, postcards, dolls or Deb's imagination. Below you will find figures for Halloween, Christmas, Valentine's Day, St. Patrick's Day, Patriotic figures and Easter, some of the most popular designs on our website and in our store! Paper Pulp, Crepe & Paper Sign 13.5x3.5"
Paper Pulp, Crepe & Glitter 8.5x9"
Paper Pulp, Wire & Glitter 9x8x4"
Paper Pulp & Crepe Tissue 12.5x4x3"
Paper Pulp, Tinsel, Crepe & glitter accents 4.5x1.5"
Paper Pulp, Crepe & glitter accents 5.5x2"
Paper Pulp w/crepe & glitter accents 11x3.25"
Hand-Painted Resin, Crepe Paper & Glitter 10.75x6.5x3"
Hand-Painted Resin, Chenille & Glitter 9.5x3.5x3"
Hand-Painted Resin, Crepe Paper & Glitter 12x5x3"
Hand-Painted Paper Mache & Glitter 19.5x9"
Hand-Painted Paper Pulp & Glitter 10.75x3"
Hand Painted Paper Pulp w/Glitter 11x3x3"
Hand Painted Paper Pulp 5"
Resin, Glitter & Crepe 8.5x5x3.5"
Resin, Glitter, Wire & Crepe 12x5.25x3"
Resin, Glitter & Crepe 12x4x4"
Resin, Glitter & Crepe 11.25x3.5x2.5"
Resin, Glitter & Crepe 10x3.25x2.5"
Hand Painted Resin & Sugar Glitter 10x4.5"
Hand Painted Resin & Sugar Glitter 10x4"